and hair; clinically proven to moisturize for 8-12 hours, the lightweight, non-comedeogenic and subtly fragranced oil provides an alternative to the traditional balm formula while tapping into the increasingly popular beauty oil trend. The unassuming bottle hides a very special formula that can be spritzed directly onto the body, or dispensed into the palm of your hand and mixed into other products. It can be used as a body moisturiser, facial oil, cuticle treatment, hand cream, massage oil, hair shine spray, intense overnight mask and so much more besides – like the beauty of the Eight Hour Cream before it, half the fun is discovering new benefits. It’s non-greasy and dries to leave a super smooth and nourished finish, although do be careful not to overdo it and leave your skin completely saturated; it’s best to build up the finish by using only a little at a time, until you get to know how much you need for every purpose. I love the fact that you can mix it in with your usual face cream for a little boost, or add it to a body lotion and massage away your aches and pains – it’s so versatile that it may even be better than the original! skin, as well as helping to boost the skin’s natural collagen and improve texture. In addition the formula contains Grape Seed Oil (abundant with Omega-6 fatty acids to intensely moisturise,) Ginger Root Extract (to improve the skin’s texture and tone,) Boswellia Resin (to soothe and calm red or irritated skin) and Vitamin E (for protection against free radical damage,) as well as Olive, Avocado & Sunflower Seed Oils for additional skin conditioning benefits and antioxidant protection. The result is a seriously hardworking product. I’ve no doubt this will be incredibly popular with existing fans of the Eight Hour Cream, but also introduce a whole new generation to the category of multi-purpose beauty. 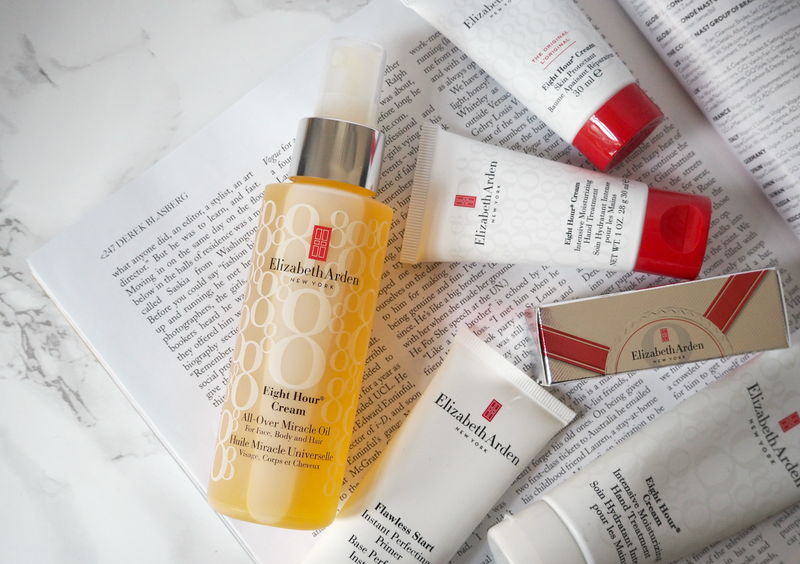 Oils are hugely on-trend right now (mainly due to advances in technology that mean they’re lightweight and quick to absorb,) with the industry benefiting from over 65% growth in the last few years; Elizabeth Arden are making a concerted effort to reinvigorate their brand and ensure they’re capitalising on key trends – but in their own way. Oils can be scary, but this spray format ensures they’re just as easy to integrate into your routine as another cream or serum – and it’s hitting store just in time for chilly days and sub-zero nights! The Elizabeth Arden Eight Hour Cream All-Over Miracle Oil launches today nationwide, priced £29.00.